Providing care for your vehicle is so much more than filling the tires with air and the tank with gas. In fact it’s quite a bit more. From checking the oil and other fluids to frequent car washes to protecting the paint, car care really never ends. But why would it? Your car loyally gets you everywhere you need to go in a safe manner, so why not return the love with frequent maintenance? One thing you should be changing in your car on a regular basis is your oil filter and your air filter. Of course, an auto repair shop can do this for you, however, they don’t call you to remind you when it’s time to change those filters out. Here are some tips for knowing how often to change your air filter and oil filter in your car. Air Filter – Quite honestly, it’s best to change your filter whenever it’s dirty. If you have a chance to look at it yourself and you notice that it’s brown and really dingy, it helps to change it out right then and there. Think of your air filter as your car’s lungs. When it’s filled with debris, it’s like your car is suffocating. Good air flow is essential to the well being of your vehicle. Another good rule of thumb is to change your air filter every 30,000 miles. Oil Filter – Changing your oil filter should be done every time you get an oil change. How often should you have your oil changed? Well, it used to be every 3,000 miles, but now it’s closer to 7,500 miles. It also depends on the year of your car. 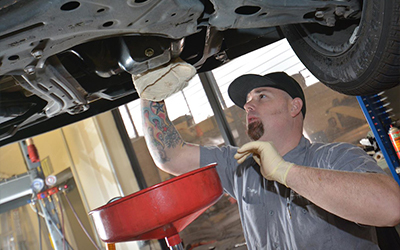 If you’re in need of an oil change, an oil filter replacement, or an air filter replacement, don’t hesitate to contact our auto mechanic in Folsom. We would be happy to assist you and help your keep your car well maintained.